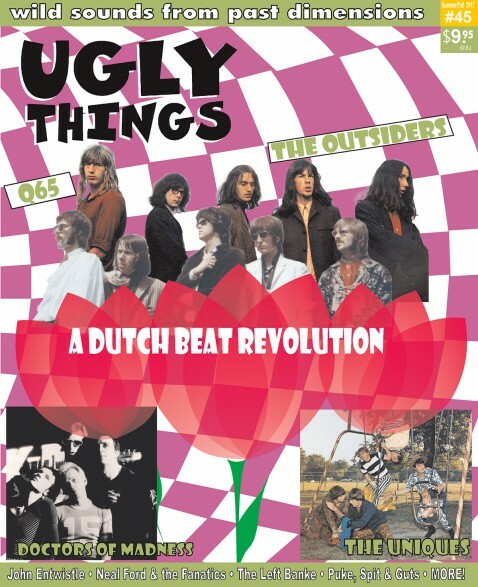 Issue 45 pays attention to two legendary, rebellious Dutch bands, Q65 and THE OUTSIDERS, and the beat revolution as it occured in the Netherlands during the 1960s. Also included are part 2 of the story about THE UNIQUES, the blue-eyed garage and soul group from America's south, plus features on THE LEFT BANKE, THE BALLOON FARM (known from the hit 'A Question Of Temperature'), Texas '60s icons NEAL FORD & THE FANATICS, occult rocker GEOF CROZIER, German freakbeat act THE TOXIC, and demented San Fernando Valley punk rockers PUKE, SPIT & GUTS. You also get revealing interviews with Richard Strange of The Doctors Of Madness, original Rolling Stones and Yardbirds manager GIORGIO GOMELSKI, and, The Barbarians' VICTOR MOULTY MOULTON, who lost his hand yet fought on to become a succesasful drummer. And that's not all. The zine also takes a peek at the personal acetate archive of JOHN ENTWISTLE and reveals the story of a New Jersey girl garage group that met and inspired THE STOOGES. The CYRIL JORDAN saga continues into the "Shake Some Action" years, and of course there's the usual review section, fully-loaded and bursting with insights and information.